Guests will be picked up from their lodge/accommodation by their guide and driven to INFLITE Charter’s Base at Taupo Airport. Once equipped with fishing gear the Guests will be transferred by helicopter to one of our many secluded rivers for a full days fishing action. The helicopter will return later in the day to pick clients up and transfer them back to their lodge/accommodation. 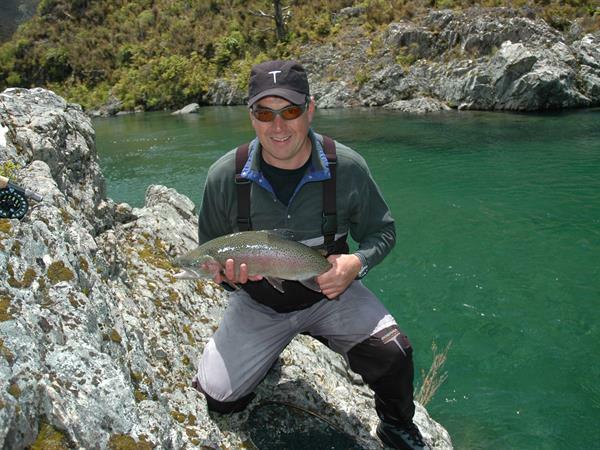 Summer time in Taupo is the dry fly fisherman’s mecca and most often the action is in the hills to the east of Lake Taupo. Helicopters, expert, local fishing guides and access to rivers like the world renowned Rangitikei River combine to make this more than a day’s fishing! The thrill of a big fish rising to take a tiny dry is an experience not to be missed, but a weighted nymph drifted through the deep pools will also bring heart- stopping action. This is the ultimate experience for the more competent angler. The double figured Rainbow and Brown trout can be sighted in the crystal clear streams, challenging your skills with a dry-fly or nymph tackle. Our experienced guides will provide you with the local knowledge for the angling experience of a lifetime. Catch and release is the practice, however there is always a great photo opportunity! This price includes helicopter transfers, land fees, guide, fishing equipment, lunch and fishing licence, however this price can be subject to change depending on land fees and fishing licences. Summer time in Taupo is the dry fly fisherman’s mecca and most often the action is in the hills to the east of Lake Taupo. Helicopters, expert, local fishing guides and access to rivers like the world renowned Rangitikei River combine to make this more than a day’s fishing!